Most people believe Emperor Haile Selassie, ruler of Ethiopia, was murdered in 1974 during a military coup. But try telling that to the Rastafarians! Most people believe Emperor Haile Selassie, ruler of Ethiopia, was murdered in 1974 during a military coup. But try telling that to the Rastafarians. To them the Emperor is the incarnation of the Messiah and still very much alive, In 1993, they descended on Ethiopia to celebrate his birthday. This film examines the Emperor's legacy and provides an unrivalled insight into the religion he inspired. Another day dawns in Sheshemane, Ethiopia, home to fifty Rastafarians. The scene looks peaceful and idyllic - until you notice children with emaciated bodies and bulging bellies. Noel Dyer, 65, the longest-remaining settler, has been out of work for eight years. He hitchhiked from England to Ethiopia, which he calls 'Zion,' forty years ago and has been in Sheshemane ever since. 'You can't get Africa out of us,' he explains. For Dyer and many others, Ethiopia is heaven on earth - a black 'homeland'. 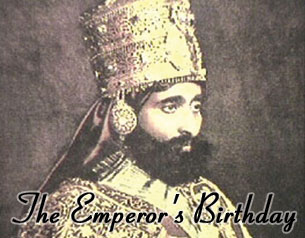 At the heart of it is the figure of Emperor Haile Selassie, who reigned from 1930 to 1974. His rule ended abruptly when army conspirators stripped him of his powers and placed him under house arrest. Thus began a military regime. When democracy was restored to Ethiopia in 1991, the government attempted to find him. All they unearthed was a pile of bones, allegedly the Emperor's. However, the Rastafarians - who derive their name from 'Ras Tafari', Haile Selassie's real name - reject the notion that he is dead. Instead, they claim that Haile Selaissie is the incarnation of the Messiah and is still alive. They believe the Bible has been perverted by white Christians, to conceal the fact that both Adam and Jesus were black. 'We the Rastafarians see him alive in the flesh. We have the courage,' says Dyer. The young men who have come to Ethiopia for the Emperor's Birthday are equally enthusiastic. 'He is a living god,' gushes one. Another one of the ways the Rastas commune with their 'god' is to get high on marijuana. 'It brings you close to God,' says Dyer. But not everyone is sympathetic to the Rastafarians' beliefs. 'The Emperor died in 1974,' insists Shamilas Desai, a tour guide at the National Museum of Ethiopia. 'But if we say that to the Rastas, they will quarrel with us.' Indeed, to the majority of Ethiopians, Rastafarianism - which began in the slums of Jamaica - is a curious movement. But despite the controversy, Rastafarianism continues to attract new supporters. To its believers it's not just a religion. It's a way of life.